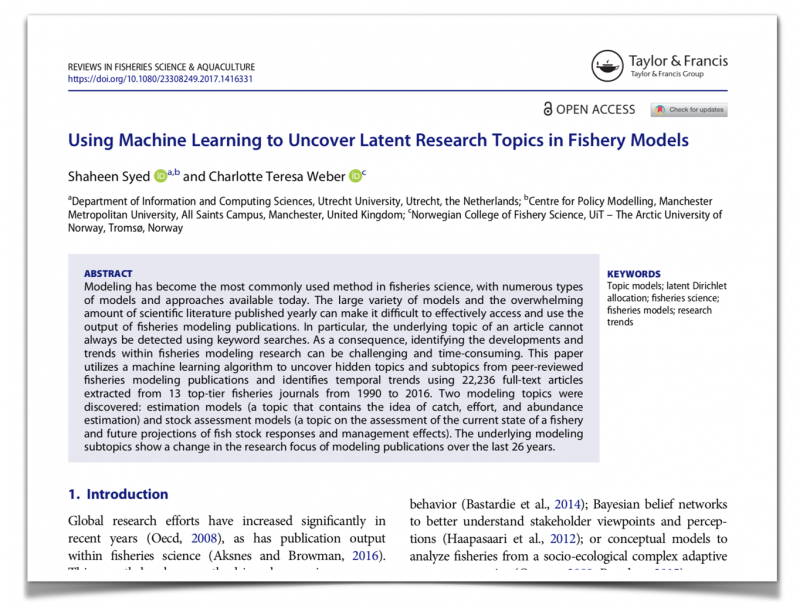 Our ESRs Charlotte Weber from UiT and Shaheen Syed from MMU/UU have published their paper entitled “Using Machine Learning to Uncover Latent Research Topics in Fishery Models” in the journal Reviews in Fisheries Science and Aquaculture. During their collaboration (blog post), they utilized an unsupervised machine learning method called Latent Dirichlet Allocation to automatically uncover topics from a dataset comprised of 22,000 fisheries research articles. Their analyses looked into topics related to fisheries models and the subsequent sub-topics found therein. By looking at these sub-topics they have explored temporal trends and identified common names of geographical areas, names of authors and species. Modeling has become the most commonly used method in fisheries science, with numerous types of models and approaches available today. The large variety of models and the overwhelming amount of scientific literature published yearly can make it difficult to effectively access and use the output of fisheries modeling publications. In particular, the underlying topic of an article cannot always be detected using keyword searches. As a consequence, identifying the developments and trends within fisheries modeling research can be challenging and time-consuming. This paper utilizes a machine learning algorithm to uncover hidden topics and subtopics from peer-reviewed fisheries modeling publications and identifies temporal trends using 22,236 full-text articles extracted from 13 top-tier fisheries journals from 1990 to 2016. Two modeling topics were discovered: estimation models (a topic that contains the idea of catch, effort, and abundance estimation) and stock assessment models (a topic on the assessment of the current state of a fishery and future projections of fish stock responses and management effects). The underlying modeling subtopics show a change in the research focus of modeling publications over the last 26 years.